"For the first time in the history of the world, a young girl climbed into a tree one day a Princess and after having what she described as her most thrilling experience she climbed down from the tree next day a Queen …..."
These now famous lines about the accession of Queen Elizabeth II were written in the visitors' log book of the "Treetops Lodge" by World renowned hunter Jim Corbett. When King George VI died in his sleep on the night of 5th-6th February 1952, the heir to the British throne Princess Elizabeth and her husband Prince Philip were spending the night in Treetops Lodge - a small tree lodge deep in the forests of Aberdare National Park near the town of Nyeri, Kenya. Princess Elizabeth therefore became Queen Elizabeth in the small and remote tree lodge the moment George VI was declared dead, even though due to remoteness of the Treetop Lodge she got the sad news later in the day, when she returned to "Sagana Lodge", her royal residence in Kiganjo, Kenya about 20 miles from the Treetop Lodge. The Treetop Lodge was built in early 1930s by Major Eric George Sherbrooke Walker and the Royal couple were visiting the lodge at his personal invitation. The lodge which was initially just a two room lodge was renovated and expanded to 4 rooms to cater to the needs of the Royal visitors. Located in the deep dense forest near a water hole and salt lick it was frequented by many animals and an ideal spot for spotting the wild animals. The original tree lodge however was burnt by Mau Mau’s on 27 May 1954 and another larger lodge was later (1957) constructed in the near vicinity. Because of its association with the accession of Queen Elizabeth, the lodge is a popular tourist spot for the visitors to the region. The Treetops is presently under renovation and expansion. 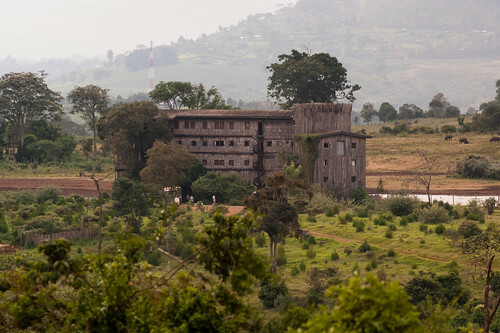 (Source: Official Web page of the owners Aberdare Safari Hotels). This is how the Treetops Lodge looked a few years back. View approximate location in Google Earth / Google Maps.